Having problems with a T800 coating. Supposed to to hold up to 13% HCl @140*F (60C). After 4 days the coating failed in the solution. This is on a roll in a galvanizing bath for sheet metal. From looking at the 200X photo, what problems do you see? Unmelts? Oxide inclusions making interconnected pores? 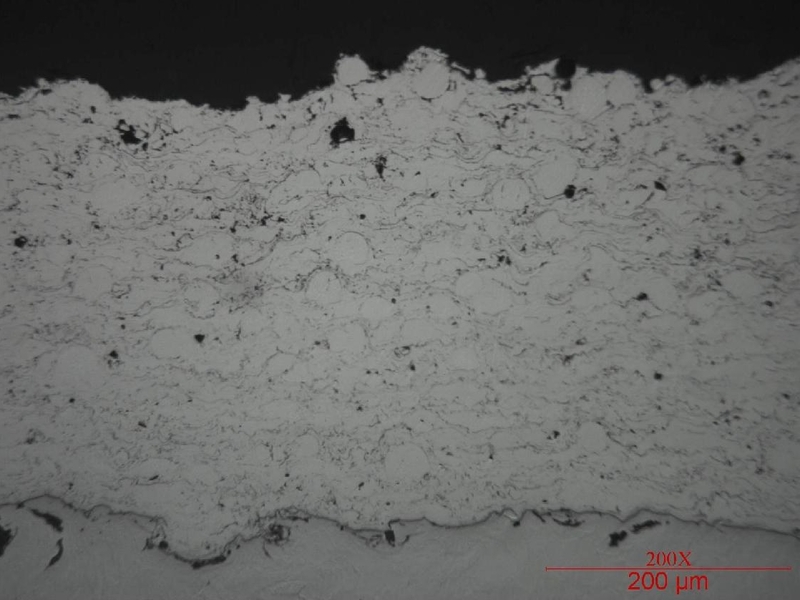 It was evaluated to 1% porosity with a hardness of 513Hv. Pic sent to Gordon for him to post up. Click image to get bigger view. Any info on the mode of failure? Has coating material been attacked at all, or is it purely corrosion along bond interface? Was coating sealed and if so with which sealer? What equipment/parameters used to produce coating? T800 is certainly claimed to be good against non-oxidising acids (similar to austenitic stainless steels). Whether it is up to 13% hydrochloric acid @140*F (60C) I'm not sure, but I would have thought it would have survived longer than 4 days anyway. So I would assume failure has come from interface substrate corrosion where coating has not been a complete 100% barrier. The photomicrograph looks fairly typical, although with higher performance HVOF you may expect slightly better density. Thanks for putting that up Gordon. The coating was done using an old DJ std. air cooled gun with propane. Need to get the parameters again. Have a DJ hybrid ready to use, but for some reason the DJ std was used. The DJ std is really not up to the task of spraying this. Most use either the jetkote with H or a jp5000. The coating cracked and flaked off. It came off in large chucks of solid coating. The top layer of the coating turned a black/rust color, versus the steel grey as sprayed look. No sealer was used, which I think was a mistake. Looking at a silicone sealer for next trial. The lower density I think comes from using the DJ std gun. If we turn it up too hot, we will get more microcracks and embrittling which will fail the coating I am sure. However, I think the unmelts and low density are making a pathway for the acid to get in and under the coating. The reason the T800 was used was to enable a Rc of 50 as the coating is on a roll that is in a galvanizing bath and needs wear resistance as well. They are trying not to replace a titanium sleeve with this coating to save $$$. I will post more pics over the weekend.